We have one very sepcial Field Spaniel. Although he's a bit smaller (only a bit), he is right there with them with everything we do. 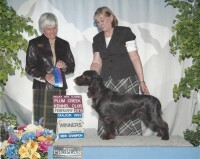 We've got one Field Spaniel that is amazing. He loves to show and is a Champion. He's up north at the time with the breeder being used as a studd for continuation of her lines.